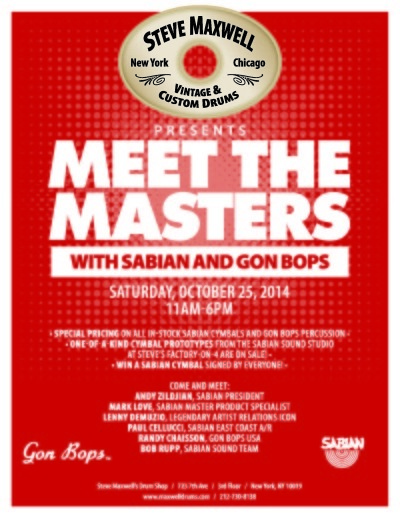 Visit Steve Maxwell Vintage and Custom Drums in NYC on Saturday, October 25, 2014 to meet GON BOPS and SABIAN President Andy Zildjian, SABIAN Vault Master Specialist Mark Love, AR legend Lennie Dimuzio, GON BOPS’ Randy Chaisson, and more from the SABIAN and GON BOPS team. There will be some very cool custom SABIAN cymbals you’ve never seen in addition to legendary Gon Bops instruments. Did we mention there are also plenty of special deals to be had? It’s all happening at Steve Maxwell Vintage & Custom Drums, 723 7th Avenue, 3rd floor, NY 10019. Don’t miss out! ← GON BOPS CALIFORNIA DRUMS ARE BACK!